Everywhere everywhere we have waves bouncing around. The sun sends them to us, across 93 millions of space. They hit our little planet; they reverberate in all kinds of ways. Some of them we capture and channel into energetic uses. Others we do not capture at all. 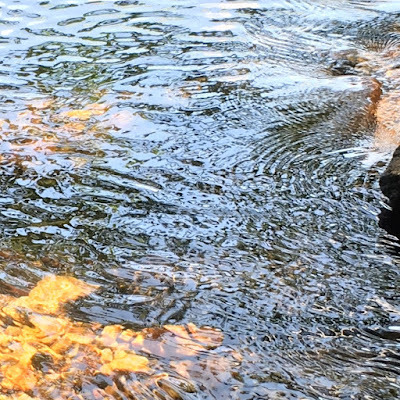 They just ripple around placidly in places unseen. 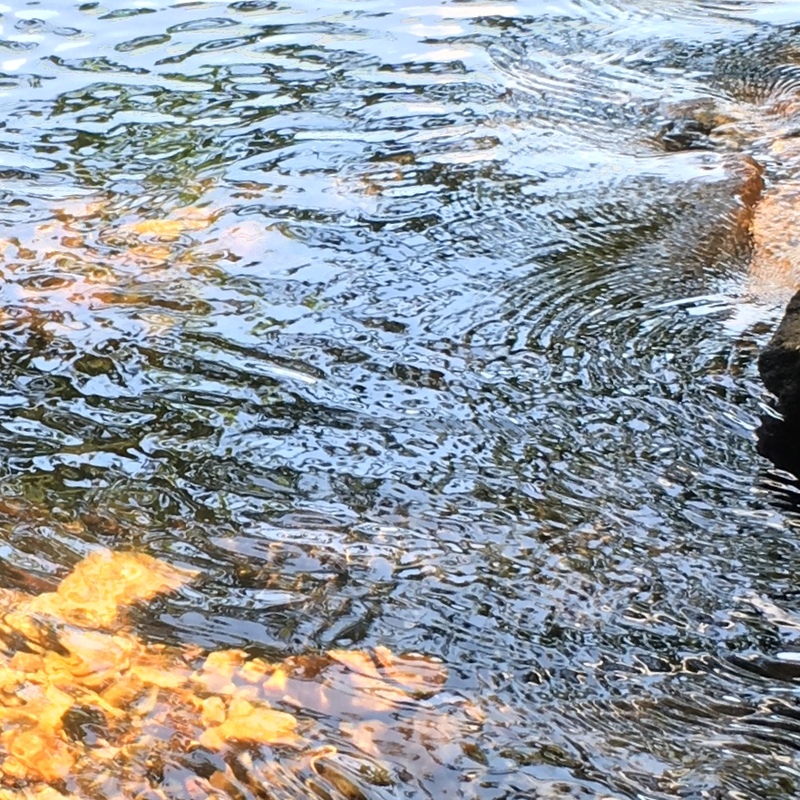 Out in the wild, in some natural place where the planetary stream gently trickles through unspoiled environs, we may notice waves just rippling along being their leisurely selves. If we peer closely at them, we may notice the universal vibration passing through our brief moment in time and space. In other locations, where humans have captured the waves and trained them into commercial or utilitarian applications, they just degenerate into more of the blahblah interference that we encounter every day in our electronified existence. Like this pic taken at a gas station, where apparently the petrol pushers have determined that we cannot be without electronic stimulation for any amount of time—even the 2 or 3 minutes it takes to fill an itinerant gasoline tank. Although it is strangely reassuring to see a human face there in the mix, especially a pretty one. . . The great physicist, James Clerk Maxwell, had a problem in 1867. It was a very old problem; many had tried to solve it before he came along. It wasn’t actually his problem to fix, but merely to figure it out; his objective was to try and determine who or what had already solved "the problem". Because, you see, the matter had already been taken care of long, long ago. Otherwise none of us would be here; nothing would be here. 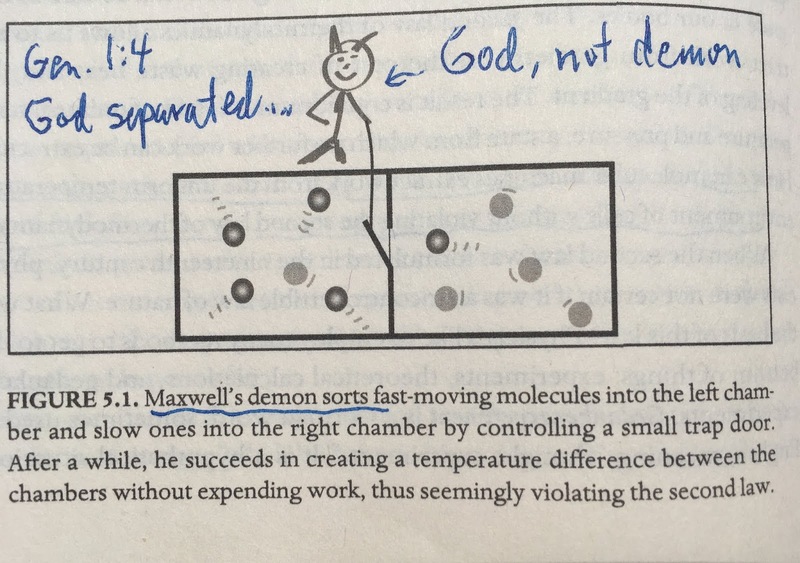 The actual problem-solver who had worked it out was not thought to be credible at the time of Maxwell's work. The problem-solver's presumptuous representatives had made such a mess of things. Consequently, in the 1800’s, the scientific community placed little or no credence in what the so-called Church had to say about anything—especially presumably scientific matters like the origin and unfolding of the Universe. 19th-century scientists and other serious researchers like Darwin, Marx and many others were all in a tizzy about throwing the God idea out with the bath water. It was a leap of faith instead of a rational inference. They did have some legitimate arguments about the Church’s faith-based input, because the so-called Church had made such a mess of things while they were running the show back in the middle ages. Two especially bad screwed-ups the Church had done happened when they had, earlier, rejected the findings of Copernicus and Galileo. But you betcha the mystery still lay unsolved when the science boys took over, long about 1800 or so. They were working on the mystery intently. And so Mr. Maxwell, diligent Scot that he was, took hold of the mantle in 1867, as many others were doing at the time, and he gave it a shot—solving the riddle. The question of how all this happened. This existence, this world we live in—how did it get here? There was, you see, a piece missing in this great puzzle of existence. In the chain of events that ostensibly took place when the universe was made, there was a missing link that no one had been able to figure out. So, James Clerk Maxwell tackled the question, striving to solve the riddle of the missing link. 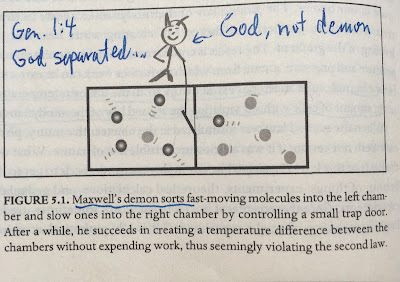 Therefore Dr. Maxwell came up with what he called the "Demon." My unschooled opinion says he could have chosen a better word. . . something like what Rene Descartes had termed it, the Prime Mover. In other words, how can atoms and molecules organize themselves to become something more than what they already are—just a bunch of damn molecules kicking around like unemployed vagrants? Or to put it yet another way: How could life have come out of dead particles? And so, as Dr. Maxwell pondered the problem of the missing link in 1867, he came up with the idea of (what was later called Maxwell’s. . .) Demon. The analogy of a demon is not, of course, to be taken literally. James Maxwell was a brilliant physicist whose work paralleled Einstein’s. His use of the hypothetical creature is merely a literary device to communicate the function of an unidentified catalyst that makes something constructive happen in an environment in which (theoretically) nothing can happen. Obviously something did happen, back in the days of universe origin, or we wouldn’t be here. Nothing would be here, if the problem had not been solved. Someone, demon or otherwise, must have worked it out. Rene Descartes, a mathematician who lived in the 1600’s, had stumbled upon the same dilemma. He had posited the idea of a Prime Mover, which seemed pretty logical at the time. Still does, if you ask me. An original cause (as in cause in effect), that caused everything else to happen, big bang blah blah etc. and so forth and so on. But what diligent mathematicians and scientists neglected to mention was that the problem had long ago been solved by a mysterious entity who had been so erroneously represented by the so-called Church: God. Not a demon, but God. The demons were the created beings who tried to pull rank on the Creator, YWHeh. Therefore, in order to now— in the 21st-century— give credit where credit is due . . . I say it was a notable accomplishment what YWHeh did, when he solved the problem of the missing link, way back in time. And he said so. He said it was good— in the first chapter of his bestseller, Genesis. "God saw that the light was good; and God separated the light from the darkness." The 2nd Law of Thermodynamics is the law that YWHeh seems to have broken when he started the ball of the universe rolling. But it didn’t matter if he broke that “Law” because he set up the whole kitnkiboodle anyway, back in the Day. That 2nd Law of Thermodynamics was an idea that we came up to try and explain it all. It wasn't something that YWHeh declared when he declared Let there be light and so forth and so on. On Day 1 (whatever that means to you) the Prime Mover separated light from darkness, and the rest is history. Not bad for a day’s work, YHWeh. Keep up the good work. To go with the flow, or to go against it—that is the question. Whether ’tis nobler to nurture the notion that mankind was innocent in some presumed condition of noble savagery—or to accept traditional religion that pronounces us guilty of offenses against Nature or against God. If we are, or were, indeed, noble savages in our beginnings, why should we have taken on the disciplines and restrictions of religion—doctrines that judge us culpable of sin and thus in need of repair, salvation, or some kind of evolving perfection yet to be realized? Hawaiians, for instance, who were alive here on the island of Kauai (I am wondering, as I write this on Kauai in 2018)—those Hawaiians who lived here in 1778 when Captain James Cook suddenly showed up with his fancy ship and his threatening weaponry, his magical gadgets, highly-trained crew, impressive use of language and documents, his tailored clothing and highly developed European culture—those relatively primitive people who first saw Capt. Cook’s two ships sail up to the mouth of the Waimea River . . .
Why should they have accepted his intrusion into their simple, primitive life? To go with the flow, or to go against it—that was their question. Would they go with the “arc of history” or resist it? Did they eventually accept highly developed European culture to replace their traditional tribal existence? Did they accede to it out of submission, or out of necessity, or out of attraction to the new fancy stuff they saw? Were they conquered? Or were they taken by the hand and brought gently, Christian-like, into 18th-century civilization, and ultimately into 19th, 20th and 21st-century lifestyle? Look around Hawaii today. What do you think? They went with the flow. One thing we know for sure about the so-called primitive Hawaiians of 1778: they knew how to go with the flow. They were here on this remote island in the middle of earth’s largest ocean, long before we technolified haoles were here, and they had arrived here at some earlier time because they knew how to make “the flow” of this life and the Pacific Ocean work for them. So now, 2018, it is what it is. Hawaii, like every other place in our modern world, is what it is. Some may lament the demise of noble savagery that has been the result of Captain Cook’s intrusion into this paradisical (though deadly if you don’t know what you’re doing) island. Others may celebrate the entrance of the Hawaiians into modern life. Captain Cook came. He left and came back again. The beginning of Captain James Cook’s Hawaii experience happened when his crew sailed their two ships to the mouth of the Waimea River— a river that flowed from mile-high Waialeale crater down to sea level at the southwest shore of Kauai. He died in 1779, shot dead by an Hawaiian on the Big Island of Hawaii, at the other end of this island archipelago. His sudden demise came in the midst of dispute between some of his own crew members and the natives of Hawaii. Many have lived and died since that time. Two days ago, up on the other end of Kauai island, the northeast end, at a strand called Larsen’s Beach, we witnessed the life-end of another person, a contemporary. The man was a traveler from Pennsylvania. He had been snorkeling at a reef in unpredictable waters when the Ocean took hold of him. A little while later, his flippers floated to shore. After we had witnessed a team of chance beach visitors (us), and then a couple of jet-skiing lifeguards from some other nearby beach, and then EMT guys flown in on a “bird,”—after we had witnessed all this collective noble attempt to coax life back into the snorkeler’s breathless lungs and heart, we saw his neon-green flippers float back to shore. Maybe he was going with the flow; maybe he was going against it; maybe he was fighting against the current, or maybe he was just going with that flow of life and death that eventually captures us all. In my case, that flow will, in the long run, take me to death, and then resurrected life, as was demonstrated by Jesus. Am I really going with the flow, you may ask, in joining the historical current of the Christian faith into which I was born? Or am I going against the rational flow by subscribing to such an incredible prospect as life after death? The Ocean is strong today. steadfast and vast, under a friendly sun. Let’s do the beach; this afternoon’s energy is vigorous. forever, upon this high strand. The eternal resonance of wonder in. in this pounding Pacific shore. you flap forever like folds of a bright banner unfurled. and the uncared-for masses of the world. as ill-informed combatants clash with their devices. You can't just bust into a coconut. Maybe you've seen one at the grocery store. But what you have laid eyes on there is not a coconut; it is the inside of a coconut. Notice that the tasty white stuff cannot be seen; its still hidden inside. There's a reason why the tasty white stuff cannot be seen; it is impossible to get to if you're a regular person. 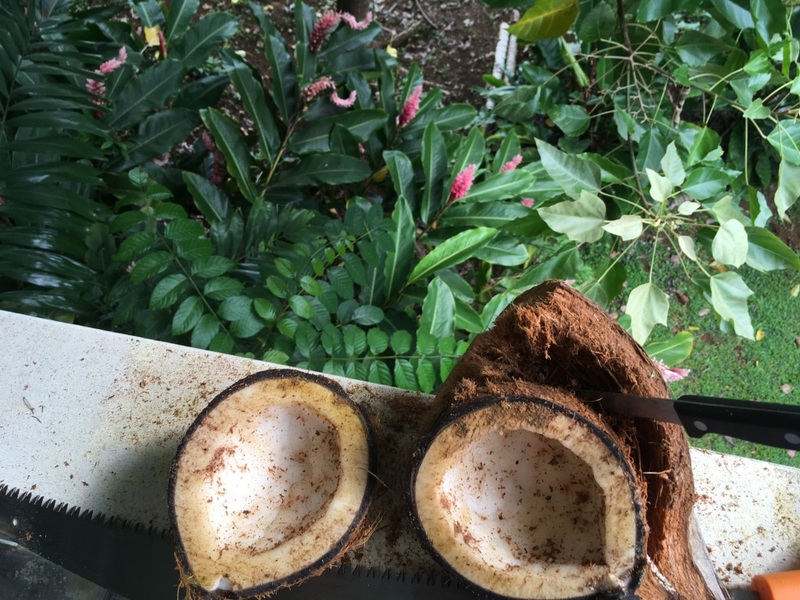 You have to be a special person to get to it--a coconut farmer, or some kind of a specialized food-processing robot, or a Hawaiian with a machete. Or a good ole boy with a sharp saw. In the grocery store, you understand, what you see of the coconut appears to be an outer shell; but in the wild, that shell is actually an inner liner. Like life itself, it's a hard nut to crack. But with a little work, some persistence, and an appropriate tool, the obstacles can be dismantled. While staying on Kauai, Hawaii, I have been observing a cardinal every morning. This beautiflul red bird has lighted upon the deckrail, shortly after each sunrise each day. His visits demonstrate a boldness on his part to venture into areas of human domain. But that boldness is tempered with a shyness by which he promptly flys away as soon as I make any movement in his direction. Comparing these bird encounters with similar episodes at our home in the Carolina Blue Ridge, I surmise a personality trait that seems to be characteristic of the cardinal breed. It’s probably my imagination that the colorful creature has some comprehension of his special status among the kingdom of the birds. He seems to understand (or so it seems to me) that this human is fascinated by his flashy appearance; he also knows that his bright profile is, in some settings, a liability, because the bright red makes it easier for nearby predators to catch sight of him and perhaps eat him. However, Mr. Cardinal’s skittishness did not interfere this morning with my continuing attempts to capture a pic of him. I was pleased this morning to find that the different physical arrangement here in Hawaii have made it possible for me to snap the pic. In this case, I, human, am representing the heavenly Father in dropping those cereal crumbs onto the deckrail for our scarlet friend. Meanwhile, feeling satisfied that I have managed to capture, here in Hawaii, that flighty image of the bright cardinal which I could never manage to obtain back home, I’ll cast another crumb of interest in here for you to nibble on. Before Mr. Cardinal visited this morning, I was continuing my read of Edward Joesting’s excellent book on Kauai, Kauai: The Separate Kingdom. In chapter 7, Mr. Joesting reports on the beginnings of commercial agriculture on the island of Kauai. The earliest enterprises were initiated by a trio of American business partners who were working with Hawaiian leaders with assistance from Christian missionaries who had arrived in the 1820’s. Long about 1835, some Americans leased a large tract of land from Kauikeaouli (Kamehameha III) Kaikioewa, the governor of Kauai. What fascinates me about this development in Hawaiian history is the changes in motivation that Hawaiian working people found themselves adopting in response to the new capitalistic farms. Whatever ancient cultural motivations that had traditionally compelled Hawaiian working folk to labor for their tribe and their chiefs—these motivations were being supplanted by new incentives, directly related to 19th-century agricultural scales and practices, and modern, capitalistic business. “The idea of Hawaiians working for an employer who paid them wages, which could be disposed of as the earner saw fit, suddenly introduced a concept of independence that was not easily understood by the commoners and was feared by the chiefs. Adding to the independence of the commoners was the fact that the commoners no longer had to pay taxes to the chiefs. It was more than the average islander could comprehend. There was nothing in their history, no precedent, no legend, that could be used to bridge the gap. . .
For many, many years I have wondered about Peter Yarrow’s mention of “a land called Honah Lee,” in that silly old song he wrote about a dragon named Puff. Just yesterday I was wondering as I wandered along the shoreline of Hanalei Bay, Kauai, Hawaii. While vacationing on the north shore of Kauai I had been feeling a little constricted by the touristy setup there. It was obstructing my sense of adventure. So, busting out of conventionality, so stealthily did I violate the boundaries of tourist propriety by launching into an unauthorized jungle trek. Past the condos and the pool and the shuffleboard court and the boats-for-rent and the obligatory paraphenalia of predictable recreation, I stepped stealthily into a kapu area of overgrown, untended wild Hawaiian hoohah! Through broadleaf wild flora damp with recent rain I did venture, stooping beneath gangly trees, tromping around some ancient black volcanic boulders and fearlessly bounding over others, I hazarded the uncharted course I had serendipitously set for myself, plodding along the secret shore, and footprinting wet brown sand, I splashed forth through shallow wavelets along the neglected eastern edge of Hanalei Bay. This untamed pocket of Hawaiian paradise has somehow proliferated between two resortified developments of American flimflam. and frolicked in the autumn mists of a land called Honah Lee." Within the deep recesses of Baby Boomer recall, Puff the Magic Dragon still yet blows through, across an ocean of imagination. Can you hear the tale? Jackie kept a lookout perched on Puff's gigantic tail." Once upon a time, when there was as yet no jet-plane, no cruise-boat, no trans-Pacific ocean liner. . . long, long ago while approaching an island far, far away, during an age in which the only transport to these remote islands of Hawaii was by sailing ship. . .
and brought him (from highly developed, civilized countries far, far away) "strings and sealing wax and other fancy stuff." Do kids these days even know about strings and sealing wax? This is ancient legend stuff. I mean, who uses strings and ceiling wax these days? Who folds an envelope and closes it and then affixes the back flap with a buttoned string and a blob of richly-colored wax impressed with a regal insignia? Nobody I know of. You? These were communicative implements of a by-gone age, when persons of certain authority or rank used strings and ceiling wax to assure a remote recipient that the letter or parcel being hand-delivered had originated with the accredited sender. Such strings and sealing wax were used in centuries long gone, when mighty sailing ships voyaged halfway around the globe from London or Lisbon or Boston or some such port of great commerce. Those majestic ocean-going vessels would arrive with pomp and fanfare at many an exotic destination along the way, where fabled creatures inhabited magical shores, places where a fast-industrializing world had only recently managed to impose its rigid demands of productivity, efficiency and conformity on clueless, unsuspecting noble savages such as Hawaiians were when all this commercializing globalization had only just begun. Puff the Dragon was the quintessential wild uncivilized creature of old; he held sway over that formerly vast, untamed region where primeval legends prevailed, as yet unspoiled by modern mediocrity, a time and place where magic and myth, not capitalizing pragmatism, still reigned supreme. So, in the 1950’s-60’s televised commercialized USA where young Baby Boomer imaginations ran wild with the likes of Mickey and Minnie and Davy Crockett and the Jetsons and the Flintstones . . .
Little Jackie Paper, the nascent civilized child, found Puff among his privileged playthings. And letting his imagination run wild, he frolicked with Puff in the autumn mists of a land called Honah Lee. For a few years, he made play of Puff— until young Jackie decided to move on to bigger and better pursuits . . . baseball, hot dogs, apple pie and Chevrolet, Elvis and the Beatles, Mustangs and Volkswagens, Lost in Space and lost in purple haze, caught up in fantasy and privileged college days, gathered up in protests and rockfests and counterculture forays, and eventually outgrowing even all that stuff and finally picking up the better “toys” of governments and companies and corporations . . .
"A dragon lives forever; not so little boys. painted wings and giant’s rings make way for other toys. and Puff that magic dragon ceased his fearless roar." Surely we now understand this about Peter Yarrow’s classic song of forsaken childhood innocence: In the end, Puff ceased his roar because . . .
Jackie ceased his playing. The roaring voice that had bellowed was not Puff's at all; it was young Jackie's intonation of Puff’s imagined roar. Remembering this old tune while trudging along Hanalei bay. . . dredges up old memories. My feeling is that the quaint longevity of this simple song slips up from beneath the surface of a sea deeper than mere child's play. It is a longing for the past; it is a vague recollection from our collective vault of wishes and dreams; it is a pining away for a former age of mankind, a time when the people who were in charge of things were benevolent and empathetic, a Camelot time before the brouhaha of democracy, a Shangri-La time before the anarchy of revolutions, before the abuses of communism. . . a simpler, Arcadia time before everything got so complicated and leaders were not so self-infatuated, a time when . . .
pirate ships would lower their flags when Puff roared out his name." The islands of Hawaii are the very tippy-tops of huge volcanoes that erupted from the ocean floor a long, long time ago. So while each one appears to be a small island, they are in fact all very high volcanic mountains surrounded by water that is a couple of miles deep. How this happened is a funny story. Several geologic ages ago, ole mother earth began spewing out a gargantuan pile of molten lava through a hot spot in the Pacific ocean floor. Solidifying as it piled upward during eons of time, the great magma pile finally popped up above sea level and became the island of Kauai. Over vast periods of time, one pile after another eventually rose above sea level to become a new Hawaiian island. The molten lava flows were being extruded from earth’s inner parts because of very high heat way down underground. This extreme hotness is always being generated somewhere down there, by mega-friction between between our planet’s internal moving parts. Every now and then the resultant outward pressure overwhelms all the surrounding crud. Molten rock then bursts through and gets spewed out through whatever weak spot or fissure it can find. Volcanoes, we call them. 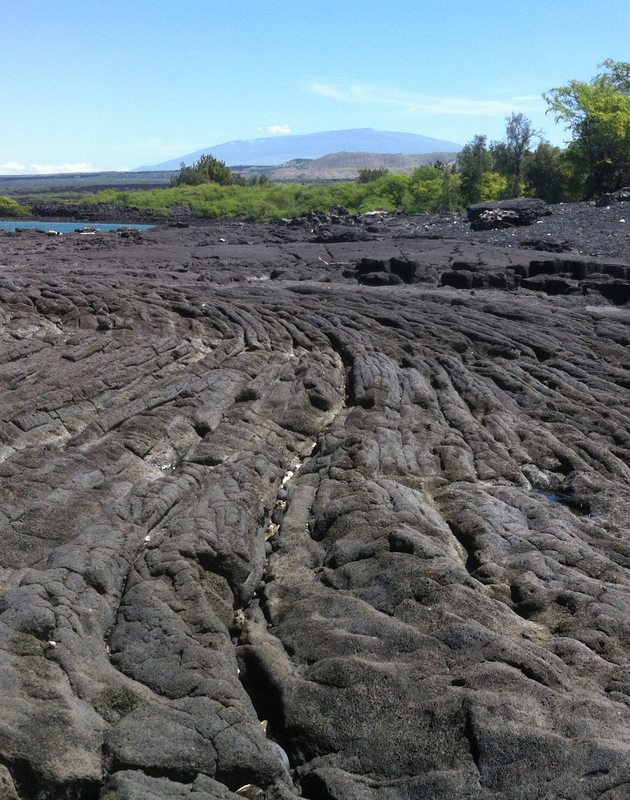 This process is how the eight islands of Hawaii were formed. If you look at a map of the Hawaiian archipelago, you’ll see that the islands are all strung out in a geographical chain. This is because, as each volcanic mass was slowly mounting upwards, the bottom of the ocean was, at the same time, taking its own sweet time sliding along sideways. Consequently, each volcanic tower became an island in a different location. Although we are not generally aware of it, our earth’s outer layer is divided into several giant mega-slabs. These vast tectonic “plates” (as scientists call them) are always shifting. Only seismologists and geologists can track these planetary developments; technicians have hyper-sensitive seismologic equipment that detects the changes and documents them. So that’s how we know about all this stuff. We have people somewhere all the time keeping tabs on the incremental, though massive, shifting of our planetary home. Way, way down deep beneath Pacific waters, a very gradual but steady long-term northwesterly movement of the vast Pacific “plate” determined in what geographical arrangement the Hawaiian islands got placed. A generally southeast-toward-northwest sliding, over time, thus established a southeast-to-northwest configuration of the Hawaiian islands chain. Each island pile is an extrusion of earth’s internal processes. These planetary developments are actually happening beneath our civilization all the time, although we are rarely aware of them. Every now and then ole mother earth makes her inner workings known by spurting out a fresh load of melted stuff. The latest is happening now on the biggest, newest Hawaiian island, which shares its name with the whole group—Hawaii, the “big island.” You may have heard about this new volcano; it’s called Kilauea. Video reports of its activity have lately been all over the web and other media. I’ve been to Kilauea, and seen the bright molten lava as it was sloshing down its deep crater hole in the ground. But that visit was a few years ago. This morning, I woke up in a breezy dwelling on the absolute other end of these strung-out islands. Here on Kauai, I spend part of my morning reading a very good book about this island, Edward Joesting’s Kauai: The Separate KIngdom. This scholastic work has opened my eyes to some fascinating history of this oldest Hawaiian outcropping. The ancient storytellers here seem to have had a sense that their beautiful islands share a common origin. Long before we had sophisticated seismology equipment to track planetary changes, we humans had ancient storytellers, people like Moses, Josephus, Homer, Confucius, Herodotus, and many others. Today I’m reading about some ancient storytellers of Hawaii. In his book, Mr. Joesting writes of native legends that go way back in Hawaiian time. It seems to me that some of the ancient storytellers must have felt a tribal urge to somehow, through tall tales, bring their islands back together as one. This is Hercules and Paul Bunyan-type tall tales, Hawaiian version. Edward cites the legend of the demigod named “Maui”— not the island of Maui, but the mythical deity whose name that island bears. As a sort of early comic-book hero, Maui did some amazing feats. “At that moment Luehu escaped from Maui’s line and the two islands drifted back to their original positions. 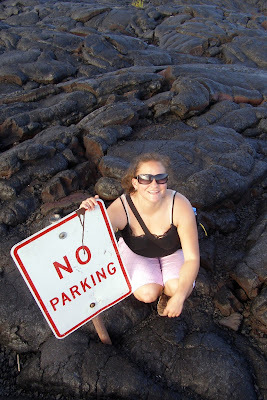 Now here’s the ancient tall-tale evidence that corroborates the geological, volcanic facts mentioned earlier in this blog: According to the legend abpit fearless leader Maui . . . So there you have it: the two islands of Kauai and Oahu shared a very important rock, which goes to show you . . . These two islands— Kauai and Oahu— surely were generated from the same volcano! Either that, or they share a very big fish-tale. Take your pick which.